Each bar has a unique serial number. Argor-Heraeus is one of Switzerland’s and the world’s largest precious metals refineries. 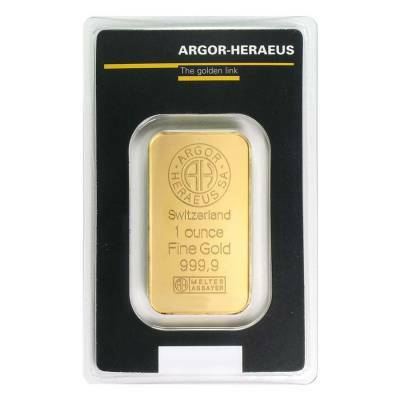 Located in Switzerland, Argor-Heraeus is also one of the world's oldest refiners and assayers of precious metals. 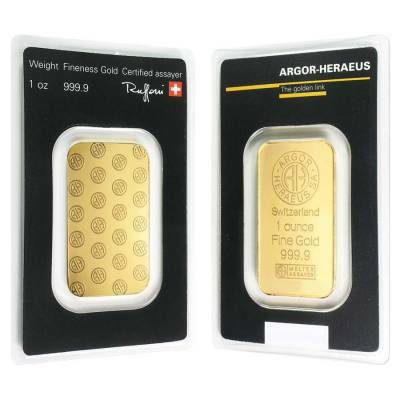 Each Gold bar is composed of 1 troy ounce of .9999 pure gold and is qualified for use in Precious Metals IRA accounts as Argor Heraeus maintains LPPM certification. 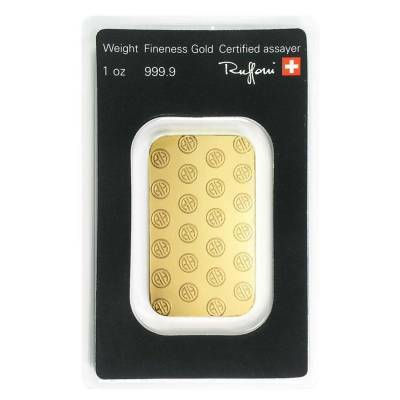 These Swiss made bars are sealed in the original assay card which guarantees the ingots metal weight and purity. Additionally, the card serves as a certificate of authenticity featuring the manufacturer name and the certified assayer. 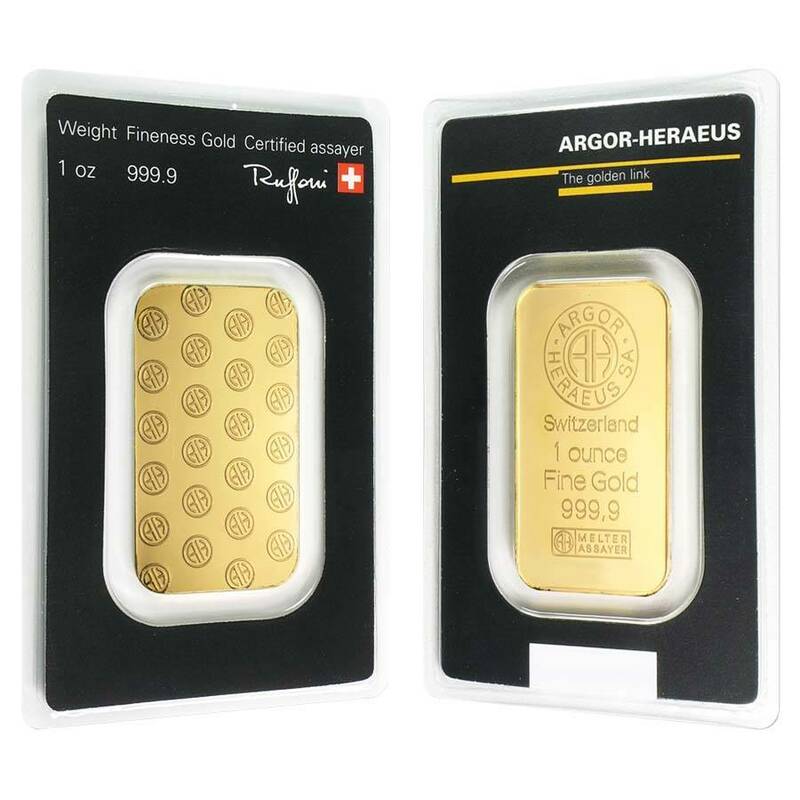 These lovely bars feature the Argor-Heraeus logo on the back side while the front boasts the impressions “Switzerland”, “1 ounce”, “Gold”, “999.9”, and the company’s logo. Bullion Exchanges offers you a great selection of exclusive items from renowned international refineries. Add this splendid and latest release from Argor-Heraeus to your collection today, and it will be carefully wrapped, packaged, and delivered to your address. If you have any questions, just call us at 800.852.6884, or send us a message, our customer service representatives will be happy to assist you. My gold bar arrived faster than expected and safely packaged. The prices on Bullion Exchanges were the best by far and I look forward to ordering from them again! For every $1 spend, you will earn 1 Bullionaire Buck which is equivalent to $0.001 off a future purchase. 1309 BB = $1.31.